The Harbour Publishing Company began as the "Raincoast Chronicles", a periodical which started in 1972 under the direction of Howard White and the Raincoast Historical Society. "Raincoast Chronicles” featured works by and about the people of the Pacific Northwest and focused on the culture and industries, particularly fishing and logging, which shaped their identity. This influence continued when Howard White incorporated Harbour Publishing in 1984. Over the years, Harbour developed relationships with others in the publishing industry, including Nightwood Editions and Caitlin Press. Not only do they publish works under their own banner and for these additional companies, they also assist with select self-publishing endeavours. The records were retained in offices and storage at Harbour before coming to Rare Books and Special Collections. 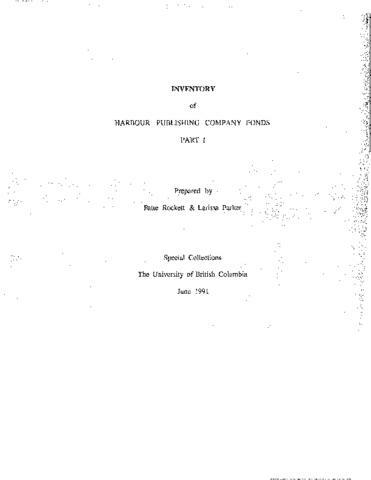 The fonds consists primarily of manuscripts and proposals (published and unpublished) submitted to the Harbour, as well as correspondence, financial records, subject files, and sales, marketing, and promotional files for the company as well as specific authors and publications. Some faxes are fading. Metal paperclips have been removed by the archivist, and in some instances replaced with plastic clips--often rust from those paperclips has transferred to adjacent papers. The fonds was received in three separate accruals: The first accrual has 44 boxes (Part I box 1 to Part I box 44) , predominantly covering 1972-1990 (arranged in 1991). The second accrual has 24 boxes (Part II box 1 to Part II box 24), predominantly covering 1980-1990 (arranged in 1994). The third accrual has 41 boxes (Part III box 24 to Part III box 65), predominantly covering 1990-2004 (acquired in 2014, arranged in 2018). Part III box 1 to box 23 do not exist. The third accrual was received without original order from the publisher. Many files, specifically large collections of manuscript edits, were removed from the accrual, and the remaining files were boxed together. Series and subseries were identified by the archivist through labels on boxes acquired from Harbour and the contents of the boxes. Inventory available. The attached PDF includes the first two accruals (1972-1990). The records from the third accrual are available from this electronic archival description. The first two accruals are a total of 13 metres of textual records. The third accrual contains ca. 378 photographs, 89 negative images, 72 slides, 2 audio cassettes, and 6.5 metres of textual records. Kristina McGuirk arranged and described the third accrual, and updated the finding aid to reflect it, in September 2018.